Hello and Welcome to the information page for DAS Kanameiji (The Pennsylvania Chapter)! The following information should answer any questions you might have regarding our chapter of the Delaware Anime Society! It comes from combining the Japanese words 'Kana' (key) and 'meiji' (stone). So we represent the DAS 'Keystone' members! Are you new or just new to the area? The Kanameiji currently meet on the last Saturday of the month from 12PM-6PM at the Ludington Library, in Bryn Mawr, PA, which is conveniently nearby a SEPTA stop (Bryn Mawr) and a bus stop (Bryn Mawr/Lancaster Avenue). We watch anime, play video games, and frequently hang out at the local comic shop and go out for food afterwards, come on by! For more info, please click on your desired button below. 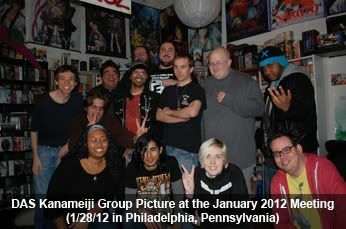 Also, check out our close pals, the Philly Otaku!